I have been a total slacker lately and have not sewn forever. Well it turns out that I am expecting number 2 and was not prepared for the exhaustion that has set in. Everyone says every pregnancy is different and I know it is true but this exhaustion was a shock to me. Needless to say I didn't have it with my first, I expected the nauseousness, but was not prepared for the lead that has taken permanent residence in my body making me unable to do anything. This is me apologizing to everyone out there for being late on sewing quilting bee blocks and everything else. I am SOOOOO not the late person and it is a pet peeve of mine so I am so sorry. I did finish my Doll quilt for the Doll Quilt Swap 6 going on on flickr. Our partners are a secret and mine has not received hers yet in the mail so I can't tell you who it is, but this is what I made. I did all of my favorite things, embroidery, applique, and log cabins. Mushrooms were my inspiration, obviously. I used Alexander Henry's Starling print for the center of each log cabin, my absolute favorite print. 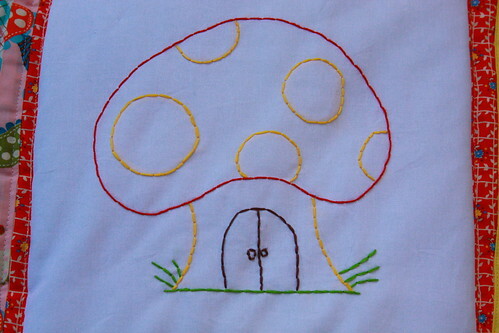 I embroidered this little mushroom house because it reminded me of the smurfs (loved that show as a kid). I made the back simple since most people hang their doll quilts on the wall and the front is so busy so it needed a simple back. We were asked to take a picture of ourselves with the quilt that we receive from our secret partner and I did even though I don't like pictures of myself right now since I have braces, but oh well. Here is a better picture of the quilt. It was made by Jennifer who's flickr name is sweetlibertygrace. 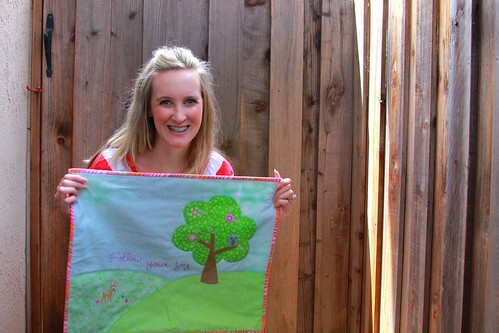 Her craftsmanship is amazing on this quilt and I love it! Here is the back of the quilt and the cute label that she made (I edited out our last names) along with some FQ's from the Minny Muu line which are totally gorgeous! Thanks again Jennifer. I love that pink mushroom print you used. I have a yard of that just waiting to be used. 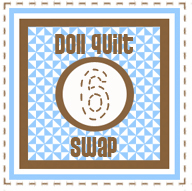 I love both your little quilts - great swap giver & recipient! 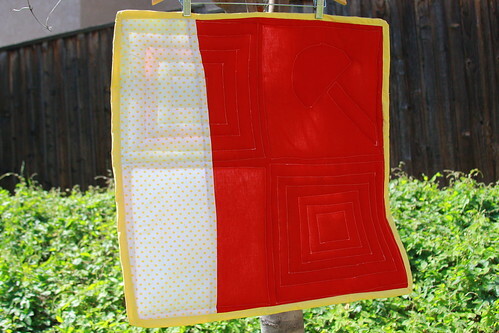 I love how bright your quilt is! I think you've done a great job with it! Do you remember what the white/blue-aqua/plaid print is around the lower right low cabin? I absolutely love it and would like to try to find some! Great job and congrats on 2! The quilt are very cute. 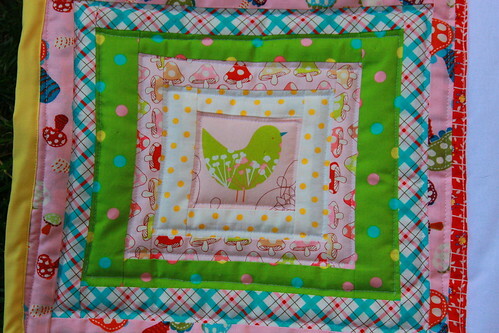 Congratulation on No 2, I adore your Doll quilt you made some bright and fun! Hope your feeling up to sewing again soon. Woohoo, congrats on number 2. Hope you get your energy back soon, the tiredness usually only lasts the first trimester. Love the doll quilt you made, and the one you recieved. Congratulations on your pregnancy! Hope all goes well! Your quilts are gorgeous! Oh! Oh! Oh! I love the mushrooms so much I think I'm going to die! My Dad is a mycologist and I keep thinking I need to make him a mushroom quilt. Cute stuff! Luv those mushrooms and the happy forrest both! Fun stuff! Love the one you made! I was exhausted also with my last pregnancy. It feels like each foot weighs 100 pounds. I left something up in the maternity wing after a test once and I made security go get it for me because there was no way in the world I could have walked all the way back up there! So cute! 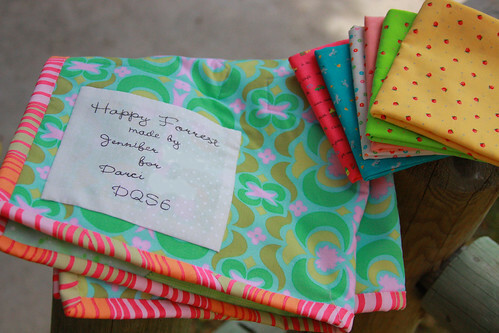 Your as bright an cheery as your quilts! 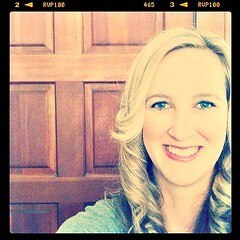 to fun! C O N G R A T U L A T I O N S on expecting #2! Such exciting news. Thanks for sharing it with us! Congratulations! Hope the tiredness goes away soon. You're cute as all get out with the braces. Keep smiling...you aren't going to take up knitting with the lead feet are you? A baby, congratulations! And I know exactly how you feel, it happened to me ;-). But believe me, it is over once you have this precious baby in your arms! 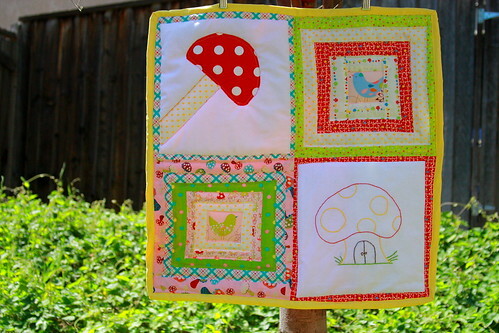 What a lovely doll quilt have you been making, I like it a lot! Please take it easy! You are growing an entire whole 'nother human bean! That would wear anybody out (and it really is more important than quiltin'!) You will be feeling good again in no time...now go take a nap!